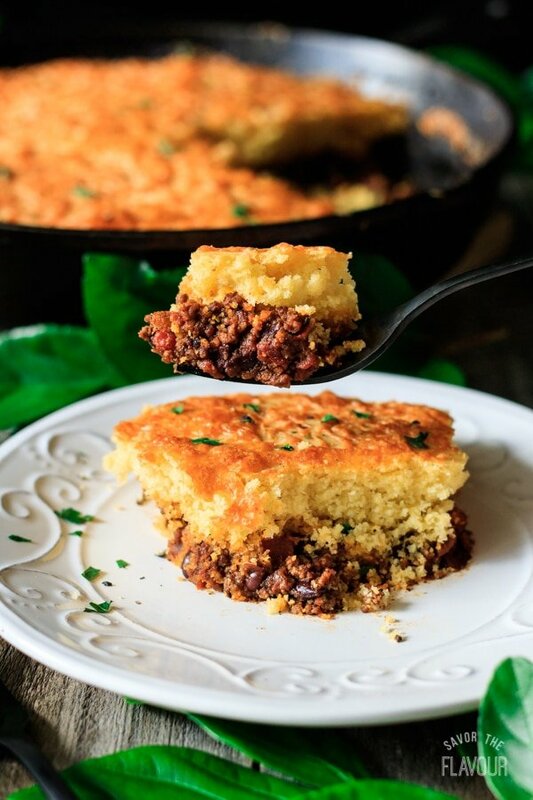 Skillet chili cornbread is an easy comfort food made in your trusty cast iron pan. Serve this family friendly recipe for dinner tonight. Your friends and family will be asking for seconds. Plus, clean up is a breeze as it dirties one dish. Want to save time doing dishes tonight? 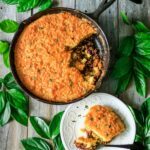 Try skillet chili cornbread. Two classics in one dish equals one happy home cook! If you have never tried this yet, you are in for a treat. Start with a base of simple, flavorful chili, sprinkle some cheese on top, then spoon your homemade cornbread mix over it all. During the last 10 minutes of cooking, sprinkle on even more cheese. It is delicious, nutritious, and is something different to make for supper. 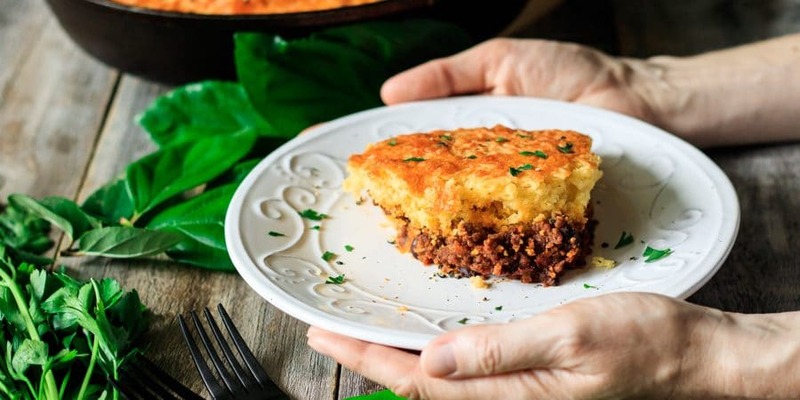 When you serve a slice, the ratios of chili to cornbread should be equal. If you prefer more chili, just put a little less cornbread mix on top. 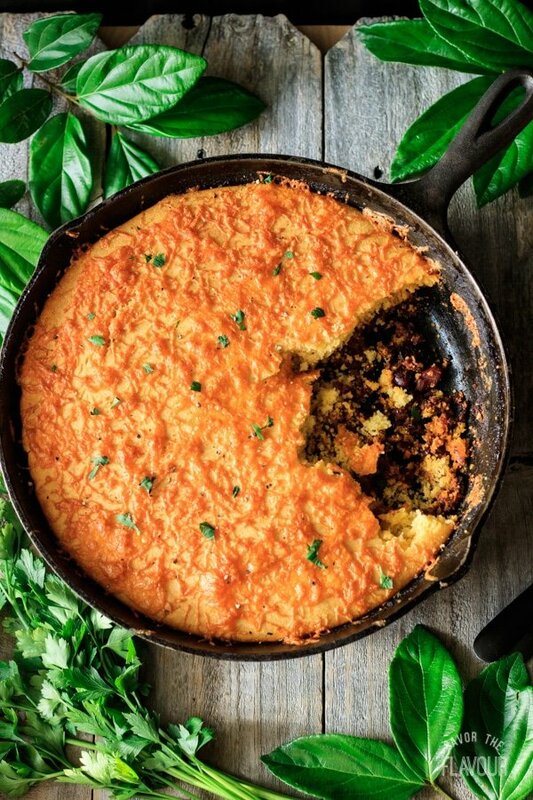 My skillet chili cornbread is mild, but if you crave some heat, add jalapeños to the chili and cornbread. Want to cut calories? Simply omit the cheese. This awesome main course will quickly become one of your go-to weeknight suppers. 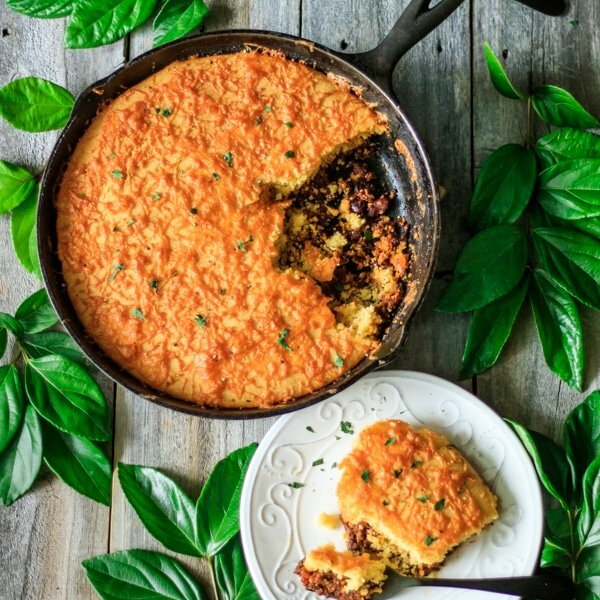 Serve skillet chili cornbread with our French grated carrot salad, homemade banana pudding, and a refreshing Arnold Palmer. Round out your meal with these other mouthwatering recipes. 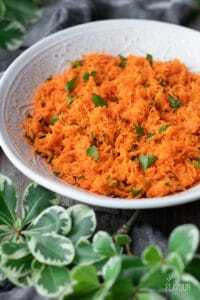 French Grated Carrot Salad: all you need to do is grate some carrots and toss in a lemony dressing to make this low-calorie spring side dish. No Bake Homemade Banana Pudding: layers of velvety homemade vanilla pudding, whipped cream, cookies, and sliced bananas compose this family-favorite dessert. 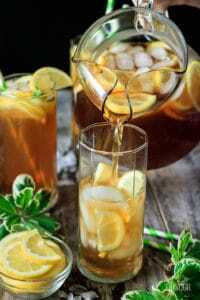 Arnold Palmer Drink: this refreshing Southern drink of sweet tea and lemonade is sure to be a hit with the kids, too. In a 10-inch cast iron skillet, brown the ground beef over medium heat. Once it’s cooked, drain the fat into a small bowl, then put the hamburger in a medium bowl. While the hamburger is cooking, chop the onion and mince the garlic. In the same skillet over medium high heat, saute the onion in olive oil for a few minutes, then add the garlic. Stir occasionally and cook until fragrant. Dump the hamburger back into the skillet. Add the diced tomatoes with the juice, tomato paste, and the rinsed kidney beans. Stir in the brown sugar, chili powder, cumin, and salt. Mix all the ingredients really well. Turn the heat down to medium low and let simmer for 5 minutes. Remove from heat, stir then sprinkle 1 1/2 cups of cheese evenly over the top. In a large bowl, mix together all the dry ingredients: cornmeal, flour, baking powder, sugar and salt. In a medium bowl, combine the wet ingredients. Start by beating the egg with a fork, then add in the buttermilk and melted butter. Stir to combine. Add the wet ingredients to the dry ingredients. Mix well so there is no dry ingredients at the bottom of the bowl. Spread the cornbread mix evenly over the top of the chili and cheese, then bake for 20 minutes at 400F. Take the chili cornbread out of the oven and sprinkle 1 1/2 cups (170g) of grated cheddar evenly over the cornbread. Bake for another 10 minutes at 400F, or until the top has a good color. Garnish with chopped parsley. If you like some additional heat, add diced pickled jalapeño peppers to the chili or the cornbread.